Puput Nastiti Devi, 21 and former Jakarta governor Ahok, 52. After spending close to two years in jail for blasphemy, Jakarta's former governor Basuki Tjahaja Purnama will walk free on Thursday into a new job and possibly a second marriage. Reports say the ethnic Chinese Christian, 52, popularly known as Ahok, plans to become a consultant to local governments, helping them to navigate the country's electronic budgeting system, and wed his girlfriend, a 21-year-old Muslim policewoman named Puput Nastiti Devi. Devi is reportedly his ex-wife's bodyguard from the time he served as governor. He divorced Veronica Tan after a 20-year marriage in April last year, citing personal issues between them that have lasted for seven years. The divorce took place after a Jakarta court found there was adequate evidence of infidelity by his wife Veronica Tan. The couple have three children and the court has granted Ahok custody of the second and third children, who are below the country's legal age of 17. "He has so many plans for his life after he's freed from the prison …. he plans to marry his girlfriend on February 15," politician Prasetyo Edi Marsudi, head of Jakarta's city council and one of Purnama's close friends, told reporters recently. Ahok had also accepted offers to speak at events in New Zealand, Japan, and in Europe and would feature on a new YouTube Channel - named BTP, after his initials - to "make money", Marsudi said. News about his marriage is still unconfirmed, however. The Indonesian police spokesman said Devi had not officially submitted a marriage request to her superior, as is required of active police officers. Purnama's sister Fifi Lety Tjahaja Purnama said on her Instagram account on Saturday that the family was unaware of any marriage plan. She denied her brother had converted to Islam to marry his girlfriend. Ahok, a close associate of President Joko Widodo, was charged with blasphemy against Islam after the circulation of a doctored video, which purportedly showed him telling residents of the Thousand Islands, a group of islets off the Jakarta coast, not to be fooled by a Quran verse that says Muslims should not vote for non-Muslims. Muslim hardliners, naming themselves the 212 Movement, rallied on Jakarta's streets in December 2016 to demand he be jailed. Purnama went on to lose the Jakarta election and after his conviction in May 2017 was sent to a prison in east Jakarta. Authorities later moved him to a jail in the city of Depok in West Java due to "security reasons". He was granted a remission of three months and 15 days. The editor of the video, Buni Yani, a former journalist, was found guilty of violating the country's information and electronic transaction law and sentenced to 18 months in prison. But he has appealed the decision and has not yet served a day in jail - in fact, he is a media relations staff member helping presidential contender Prabowo Subianto in his upcoming fight to unseat Widodo. The blasphemy case against Purnama fuelled religious intolerance in the country and encouraged its use as a political campaigning tool, analysts said. According to a survey by Indonesia's Survey Institute (LSI) in September, 38 per cent of Muslim respondents objected to non-Muslims' religious activities, a jump from 36 per cent in 2017. More than half of Muslim respondents also said they objected to non-Muslims building religious facilities, a four per cent increase from 2017. "The 212 Movement is not the peak of radicalism, but it has widened the tap for religious intolerance in Indonesia," says Burhanudin Muhtadi, a researcher at LSI. The 212 Movement also resulted in a coalition between Muslim hardliners and politicians: Muslim conservatives are supporting Prabowo Subianto and his running mate, former Jakarta vice-governor and entrepreneur Sandiaga Uno. Though in prison, Ahok was still able to capture the public imagination. A movie about his life in Belitung, A Man Called Ahok, was released last year and as of November had been viewed by at least 1 million people. Ahok was regent of East Belitung before being elected as Jakarta vice-governor alongside then-governor Widodo in 2012. Marsudi said former president Megawati Sukarnoputri, the grand dame of Indonesian politics whose political party now supports Widodo, was among supporters who sent Ahok food, fruits, clothes and books while he was in jail. Last week, Ahok wrote an open letter to his supporters recommending them not to celebrate his release at the prison. He said his time in prison had helped him learn self-control. "If I were elected I would become a man who only controls the City Hall, but [in prison], I learned how to control myself," Purnama said. "If I were elected I would be more arrogant and rude and I would hurt more people's feelings." He urged his supporters to call him by his initials BTP and not Ahok to mark how he was a changed man. 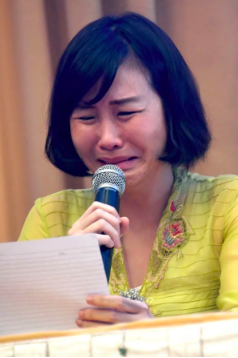 "I also want to apologise to Ahokers, all of Jakarta's civil servants, even my haters, of all the things that I've said and done that have hurt you and your family," Purnama said. "I am sorry and I hope that you will call me BTP now, not Ahok, after I get out from here."